I haven’t posted in a while, but as I mentioned in my last post of several weeks back, so many things I was knitting were either Christmas gifts, or sooper seekrit test knits (two of which I am still not at liberty to post). Completed 28 FOs (14 cowls, 4 pairs of socks, 4 hats, 3 shawlettes, 2 pairs of fingerless mitts, and a pair of dishcloths). Among those were test and sample knits for at least 4 different designers. I had challenged myself to do 12 Cowls in 2012, aided greatly by a 5 Cowls in 50 Days KAL….I have no plans to continue the trend in 2013. 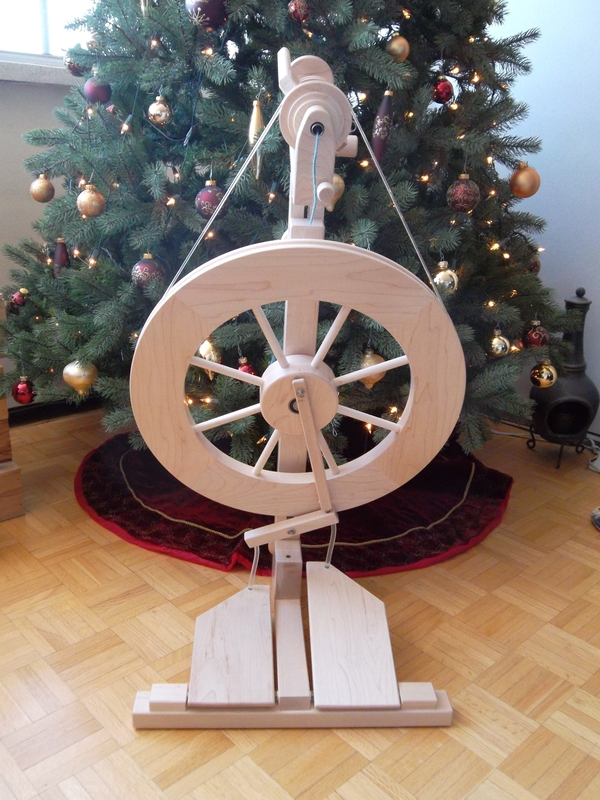 Got a wheel for Christmas…a beautiful Lendrum DT, which was a joint gift between several family members. Pretty, isn’t she? This year, my plan is to learn fewer “brand new” skills, the sole exception being colourwork, and to improve on the ones I learned last year, most notably wheel spinning. I have a lot of beautiful fibre that I am looking forward to spinning up. I have also set a goal of knitting up a new pair of socks every two months. That may not sound like much, but I knit mostly plain vanilla or 3×1 ribbed socks, and they tend to be my “knit in public” projects so they progress fairly slowly. I have plotted out several projects for the Sock Knitters Anonymous group on Ravelry that will take me to the end of August (their yearly challenge schedule runs September to August). Cast on for January occurs today, or tomorrow as I have two things on the needles that are destined to become my first two FOs of 2013 and a test knit cowl on which I am woefully behind. My last “resolution” so to speak, is to post a bit more often here and better track FOs in posts. What are your knitting/fibre-y goals for 2013?